My life has been a roller-coaster ride at times much like yours, I’m sure. Expectations, responsibilities, and everyday pressures can take a toll on anyone. Imagine dealing with the normal everyday stress of life while trying to build a business and balance having a chronic illness like Muscular Dystrophy (MD). When someone without a chronic illness wakes up to the buzz of their second (or maybe third) alarm in the morning, a lot of thoughts may be running through their head. Is it 7:00AM already? Do I really need to go to work today? Can’t I just lay here for another 10 minutes and still make it to work on time? Will I be able to get out the bed without falling today? Will I have the energy to attempt to tackle my to-do list? How long can I actually work today before I start to experience pain? That’s what it’s like to wake up with MD. It’s a never-ending round of questions that can alter the flow, productivity and course of my day. Not only does it make everyday life a challenge, it also affects my business. Will I have the energy to send this email today? What physical challenge will I face today? All these questions and more are constantly flowing through my mind, and can seem a little deflating at times, but what good story is absent of any struggles? My villain just happens to be MD, and the hero happens to be me. If you are living with a chronic illness of any type, I want to encourage you to keep pushing forward, especially if you have dreams or are in the process of creating your own business or brand. Having this passion project gives me the motivation and purpose I need to get up every morning and find a way to get things done. Even if only one or two things get done from my list, I make sure I put what energy I am able to muster into getting those things completed. When I have the strength and opportunity to go out and share my Girls Chronically Rock brand with the world, it gives me a sense of fulfillment and purpose that I wouldn’t be able to achieve if I didn’t fight to get out of the bed every morning. I won’t let MD stop me from reaching my goals and pursuing my purpose and neither should you. 1. Have something that keeps you sane. When I can’t find the strength to do work or when I just need to get my mind off of everyday life, I watch my favorite shows. DVR is the BEST thing to ever happen to me (any Love &amp; Hip Hop or Jane the Virgin fans out there). I get excited to catch up on my favorite series and having this outlet helps me remain balanced and upbeat when not working on my business. Find that one thing you love to watch, play or enjoy that helps you unwind and relax. 2. Have goals for your business that you follow. I have dreams for bigger and better for my business. One day, I d’ love to see the GCR brand in Target and bigger department stores, but that dream isn’t going to happen overnight. I have to continue to plan, evaluate, network and put myself and my brand out there in order to reach the right people and make the right connections. Battling a chronic illness is not knowing what happens next. I am always hoping for the best and having goals to keep my focused on the future are key to growing and developing a business. Make a vision board for your business and look at it every day to inspire you to dream bigger, work harder and aim for the moon (you’ll fall among the stars). 3. Have a Plan for Your Slower Days. I am queen of the to-do list. I’ve been super organized since being a little girl (just ask my mom), and I take pride in having a strategy for what’s next. You have to have a plan A and plan B for the days when you literally can’t make it out of the bed, or if you’re like me, you have leg or back pain that prevents you from sitting up or being in a comfortable working position. Make a plan that can be done in any state you may be in. Your future self will thank you. 4. Know When You Need to Just Rest (and be ok with it). Sometimes, the activities from the day prior can influence the degree of energy I have for the following day. I can’t control what my body wants to do - like anybody, but with a chronic illness it can be even more of a challenge. So, don’t fret about taking an hour, day or two in order to get your strength back. Sometimes, one productive day can get the same results of having a few hours here and there throughout the week. Work a few rest times and even days into your schedule to make it feel less like a day wasted. A day rested is another day of strength gained. No matter where you stand when it comes to chronic illness or starting a business, you have the ability to pursue your dreams and live your best life. Take these notes, make them your own and remember that chronic illness is just a chapter of your life. There is still so much more left inside of you and so much more to your story. Dream big! 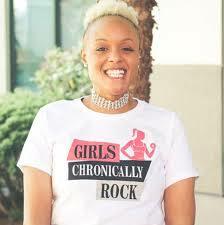 Keisha Greaves smiles at the camera, wearing a “Girls Chronically Rock” shirt. Keisha Greaves is a motivational speaker, the founder of Girls Chronically Rock, and the Massachusetts State Ambassador for the Muscular Dystrophy Association (MDA). Girls Chronically Rock (www.girlschronicallyrock.com) offers inspired fashion celebrating Muscular Dystrophy and other chronic illnesses. Over the past few years, Keisha has been featured in Improper Bostonian, Boston Voyager, Herself 360, Liz on Biz, among other outlets on and offline.